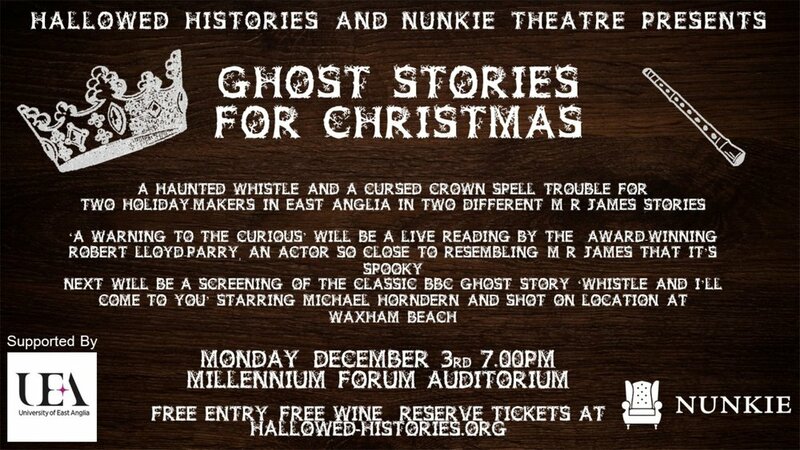 We are very pleased to announce that our last screening of 2018 will be a collaboration between Hallowed Histories and Nunkie Theatre. Nunkie is an award-winning theatre company dedicated to keeping the work of M. R. James alive. Nunkie's Robert Lloyd Parry will be in character as M.R. James, reciting the classic ghost story, 'Warning to the Curious'. This tale focuses on the lost crown of the ancient kings of East Anglia, and how digging in the past can have chilling consequences. These readings really have to be seen to be believed - part performance art, part reading, part ritual, it will guarantee to scratch that itch for a Christmas ghost story. After the reading there will be a rare chance to see the 1968 BBC adaptation of 'Whistle And I'll Come To You', starring Michael Horndern. This is one of the best ghost stories made for television, and still has the power to chill to this day. Free wine to keep off the winter chill. Demand will be high for this free event, so please do not reserve a ticket unless you are sure you can make it.